The January 2015 reading featured two Detroit writers, Steve Hughes and James LaCroix, and a Windsor, Ontario writer, Gustave Morin. Snow had fallen all day, so the crowd was initially sparse. This gave me the chance to meet Steve Hughes, who recently turned to poetry after years of writing fiction. I also learned about Steve’s own reading series, the Good Tyme Writer’s Buffett, a collaboration with the Public Pool gallery in Hamtramck, which I will cover in a later post. The audience had grown by the time the poets started reading. Steve introduced his work by talking about his poetry process: taking stories he had written and chopping them up. The poems retained their narrative backbone while being transformed into dark confessions, with speakers torn by violence and desire in drunken apartments. The scarred and broken body was a recurring image, ambiguously situated between castration and sacrament. Perhaps a figure for the poems themselves, fragments from some prior text. Gustave Morin gave a long introduction, including a story about his recent interest in VHS tapes and Abbott and Costello. His energy was intentionally disruptive, almost frenetic, his prologue taking as much time as the reading, a kind of deliberate play with the institution of a public reading. As a writer whose work is primarily in visual poetry, Gustave told us that readings are sometimes paradoxical and uncanny for him. The poems themselves snapped and crackled with a complementary energy–I was particularly taken by “Souvenir,” a work that transformed the repetition and iteration of concrete poetry into sonic ends. James LaCroix was the final reader. He began by discussing his own development, particularly his deliberate choice to eliminate references to “blackness” in his early work. His poems are sparse, stripped down–at times, he confessed, almost edited away. He ended the reading by explaining how recent events–Ferguson, New York–had caused him to begin reinvestigating the history of racial violence in the US. His last poem was based on real events in the American south, when a black man was accused of murder and lynched. James’s poem leaves us with the voice of the accused, explaining how he had only killed the man in self-defense. A different kind of scar. After the reading, I chatted with Gustave about the page and the podium as different modes of performance, the relationship between writers and audiences, and the link between Windsor and Detroit. He talked about the influence of a Rust Belt aesthetic on his own work, most notably Cleveland's d.a. levy, a nexus that includes Windsor in a kind of transnational exchange. I’m thinking about space when I met up with James Hart III a few weeks after the reading, when he gave me a copy of his latest book, the thirteenth MS, published by Soft Sculpture Press in Hamtramck. James suggests that the lack of population density in Detroit creates both community and isolation among writers. People work alone, but strongly support one another in a kind of solidarity that crosses aesthetic lines. At the same time, James suggested that the distances of Detroit show up as an inverted internal space in the poetry. 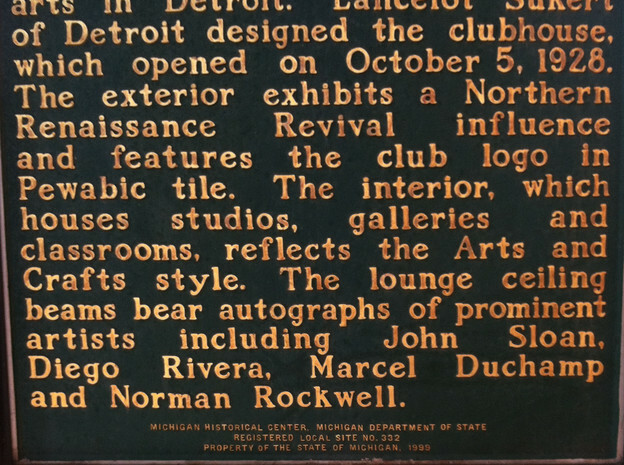 The historical plaque posted outside the Scarab Club lists some of the artists who have visited the building, proof that Detroit has a long history of exchange across space, somewhere between isolation and community. Gustave pointed out to us that Marcel Duchamp’s name is on the list.